How Kohli accelerates in ODIs --- Overs 1-15: Faced 1728 balls in 68 innings (average of 25 balls per innings) and scored at a run rate of 4.12 Overs 16-30: Faced 1813 balls in 55 innings (average of 33 balls per innings) and scored at run rate of 5.00. Overs 31-40: Faced 754 balls in 32 innings (average of 23 balls per innings) and scored at 7.01. Overs 41-50: In the final ten overs (played 17 innings), he has faced 12 balls on average per innings and scored at 9.07. When they first donned the Indian colours, the likes of Ms Dhoni and Yuvraj Singh were self-assured, resilient, fiercely talented and more. Today, though, Virat Kohli seems to have outmoded his predecessors in a manner that has made him the face of Indian cricket's next generation. 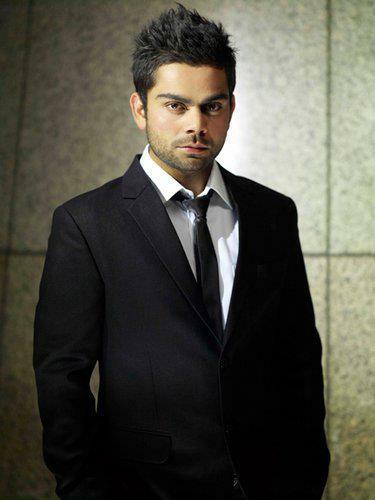 He has scored 13 centuries in 90 ODI matches. Those are phenomenal numbers by any yardstick. Look closer, in a comparative framework, and the numbers hit harder. Kumara Sangakkara, for instance, has scored 14 hundreds, 11 of those from No. 3 or higher, in 333 ODIs. Virender Sehwag has scored 15 in 249 matches, and Gautam Gambhir has 11 in 139. These stats, striking as they are, tell us a thing or two about the sort of prospect Kohli is for Indian cricket. If one goes by the exterior - the spiky hair, tattoos, the swagger and arrogance of a confident young man, Kohli epitomises 21st century Indian youth. But the way he bats, especially in the first half of each innings, he seems the antithesis of how young cricketers in India like to bat in this day and age of T20 cricket. These days most young men prefer to go after the bowling right from the beginning, and to keep hitting it till they last. It takes your breath away when it comes off, and looks woeful when it doesn't, but taking a bit of a risk seems to be the new way of living. Kohli, on the contrary, is old-fashioned when it comes to constructing his innings. Regardless of his personal form, familiarity with the attack and the conditions, he always starts slowly, albeit confidently. At the beginning of an innings, every batsman is slightly edgy and likes to get bat on ball and score a few to get going. This urge to get on with the game is even stronger if you are in good form. It must take immense self-control for Kohli to resist that temptation every time he walks out to bat these days, and to stick to his original plan of biding time. His self-control at the beginning of every innings is the primary reason for his consistency. Exercising this self-control would be a lot easier for someone who doesn't have as many shots as Kohli does, which makes his self-denial more creditable. His ability to plan meticulously and then diligently follow the plan is the common thread in most of his innings. Conventional wisdom suggests that the bigger the arc one's bat creates, the more power one generates. The arc starts from the top of the backlift and finishes with the follow-through after playing the shot. The best way to ensure a bigger arc is to allow the top hand to remain in control for as long as possible and extend the arms fully (elbow not bent) after playing the shot. Kohli's bat-swing, however, is not quite how the coaching manuals say it ought to be. He has a relatively short backlift, and an even shorter follow-through. But he generates phenomenal bat speed by flicking his wrists at the point of contact, which in turn generates immense power. The flip side of such a bat-swing is that he is a bottom-hand-dominated player. Once again, though, by delaying his strokes, he has found a way to be equally fluent through the off side. 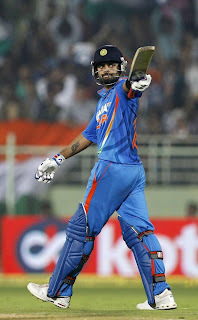 When I saw Kohli for the first time, I was a little sceptical about his short front-foot stride. To make matters more complicated, that short stride was going far too across. While the short and across front-foot stride allowed him to whip balls pitched on middle through the on side, it also made him slightly susceptible to full-pitched swinging deliveries, or when the ball deviated appreciably off the pitch. During one of our conversations while playing for Delhi, I told him about my observations. He assured me that he had found a way around it, which was by allowing the ball to come to him. I saw merit in his method of dealing with the shortcoming, but I wasn't fully convinced that it would work at the highest level. By scoring 13 ODI hundreds while batting at No. 3, he has certainly proved that his solution works just fine. It also proves that technique is slightly overrated at times. In fact, Kohli's method of overcoming his technical deficiency is his biggest strength: playing very late. By allowing the ball to come to him, he is able to find the gaps more often. Playing the ball right under his eyes also ensures that he misses fewer deliveries, and so the perils of the short front-foot stride are taken care of. He may still find it slightly difficult when the ball is pitched up in seaming conditions, but considering the way he has evolved as a batsman, I don't have any reasons to believe that Kohli won't find a way around that too.